The four-driver, three-way Silver 300 is the second-to-the-top model in the newly overhauled Silver line. (This is the sixth generation of the long-running Silver series.) 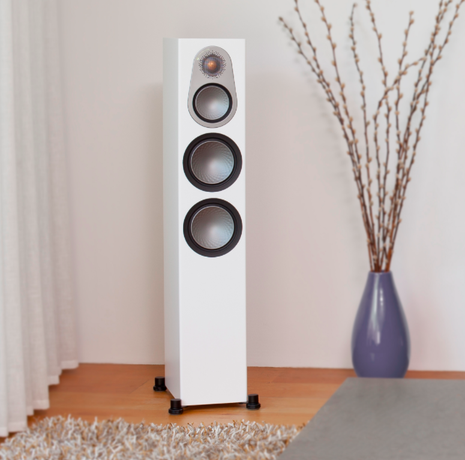 The Silver line consists of two bookshelf speakers, three floorstanding models, a center-channel speaker, surround speakers, and a subwoofer. The 300’s slim cabinet is supported by outrigger feet that provide stability as well as the ability to level the speaker. The rubber-coated feet will accept spikes for greater performance. (What are the three words an audiophile should never utter in front of his spouse? “Carpet-piercing spikes.”) Two pairs of binding posts are provided for bi-wiring. Each of the woofers is loaded in a separate ported enclosure, resulting in two rear ports. Monitor Audio says that the Silver 300 was designed to work well in typical rooms where the speaker must be close to the backwall. The Monitor Audio Silver 300 is an extremely accomplished product that offers a level of sound quality unexpected at this price. I was especially impressed by the fact that the overall design is so well balanced and complete. The speaker doesn’t excel in just one or two areas, but performs admirably across the board. I must reiterate my comments about the build and finish quality. You can spend five times more for a pair of speakers and not get book-matched wood veneers—and with six finish options to boot. That audiophile ethos was on full display in the Silver 300. And when combined with skilled technical design and efficient manufacturing, you end up with a speaker that makes true high-end sound eminently affordable.